Karate Student vs. Martial Artist? 1. There are ____ bones in the hand. 2. _________ connect muscles to bone. 3. The most effective way to stop bleeding is ___________ _____________. 4. If a martial artist is struck in the head and loses consciousness they have developed a ___________. 5. A single punch to the chest can stop a person's heart and kill them. True or False? 6. It takes ____ pounds per square inch of pressure to break a human bone. If you are a yudansha you should have gotten the majority of these questions correct. If you are a Sensei you should have gotten them all correct. That being said, if you did not get them correct its probably not your fault. Your curriculum is incomplete as is 99% of the martial arts curriculums in the United States. Back to basics: Studying karate-do does not make you a martial artist. Studying martial arts with a focus on karate-do helps you become a martial artist. Lets use the analogy of academic training. Obtaining the rank of Sho-dan is like graduating from high school. San-dan compares to a Master's degree and Go-dan is on the same level as a Doctorate degree. When you go to college (undergraduate) to obtain a Bachelor's Degree in Physical Education you don't just study Volleyball and weight lifting. You also take language, general psychology, literature, mathematics, etc. In martial arts, specifically karate-do, we should have a rudimentary understanding of human anatomy and physiology as well as basic communication skills, general health and first aid, general psychology, abnormal psychology, etc. They all apply to our art. How often do you hear a "karate-ka" demonstrating a technique spouting off about "when you hit your muscles turn your arm like this and it causes the person you hit so much pain they cannot fight any longer." (or something to that effect). Its not always because they are simply ignorant, more commonly it's because that’s what they were taught because that's what their sensei was taught , etc., etc., etc. Given enough time almost anyone can learn a punching or kicking technique. After a few thousand repetitions most anyone can even learn a kata proficiently but that does not mean they are a martial artist. Look at the old masters, many of whom would spend years perfecting a single kata. In their life time they might master 3 or 4 katas total, and yet who would say they were NOT martial artists? True they only worked a couple of katas but they also knew Hogan, Chinese, and Japanese. They knew rudimentary (and sometime advanced) folk medicine, weapons, farming, practiced Ikebana (the art of flower arrangement), Chado (Japanese tea ceremony) and/or Shodo (Japanese calligraphy). They developed humility based on a very class oriented society. They cultivated service to others as Social Security WAS your neighbors. They learned interpersonal communication by learning to listen, an art frequently forgotten in our society. Okay Hakase; why should this matter to me? Every night in every state of the union there is a karate class being led by a mudansha or inexperienced yudansha who leads the class through this exercise or that. Sometime calisthenics, sometimes "techniques" - many based in ignorance of ergonomics, anatomy, physiology and general common sense. Difficulty of execution, pain and complexity combine with ignorance and ego to produce dangerous movements. The results vary. Sometimes, if they're lucky, they merely produce soreness. Other times they injure the participants or drive off new students who labour under the misapprehension such ego driven Tom Foolery are actual martial arts techniques. 1. Concomitant training: e.g. kyu-progression combined with general First Aid training. 2. Promotion requirements that incorporate mindfulness training, language training (not just how to say "zuki" or "chudan soto shuto uke" although therein we do have a good start. 3. Many students are already in school (e.g. 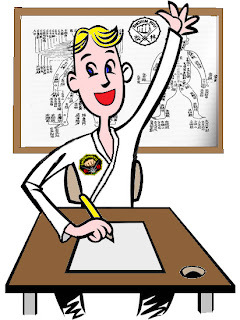 community college, undergraduate even graduate programs) why not have them bring their studies into the dojo? 4. Community service, helping others, not just giving money but helping those down on their luck; You cannot teach humility by talking about it. (Likewise not all community service requires sentencing by a judge!) What if promotion to Sho-dan required 20 hours of documented community service? (No, washing sensei's car is NOT community service). 6. Bottom line many students do NOT want to be artists, they want to learn karate, for whatever reason. Students who want to be martial artists remain martial artist they entire life and go on to be the Sensei's of tomorrow. The big question is: Which type of student are you? 2. Tendons connect muscles to bone. Trivia: A Tendon rupture can take longer to heal than a fracture bone. 3. The most effective way to stop bleeding is direct pressure. NOTE: ALWAYS wear latex or nitrile gloves when applying pressure to any surface where blood is present! 4. If a martial artist is struck in the head and loses consciousness they have developed a concussion. NOTE: Any period of loss of consciousness requires medical evaluation. The individual should NEVER be allowed to drive themselves. NOTE: The condition is called Commotio cordis. It has been documented with karate, baseball, and other blunt force trauma. It is more common in karate than boxing as boxing gloves deliver the force to a wider surface area whereas a properly delivered chudan-zuki makes contact with the knuckles delivering the force abruptly to a more concentrated area. 6. 75 pounds per square inch of targeted precise pressure will break almost any human bone. NOTE: That means 75 PSI actually delivered to the bone itself. If you punch someone with 75 PSI you will rarely break a bone because much of your force is absorbed by soft tissue (i.e. skin, muscle, tendons, viscera). Because of these physics, where you hit is almost as important as how hard you strike. A kick to the thigh delivering 150 PSI is highly unlikely to fracture the femur (thighbone) as the thick thigh muscles will absorb most of the force. However, the same 150 PSI kick delivered to the temple (either side) where the skin and muscle may be less than an inch in thickness can easily fracture the skull and cause immediate loss of consciousness. Well, actually, no. Problem not solved but Emergency Room visit created. Physics 101: Moving Fist + Immobile Tree + Abrupt Deceleration = Damage to the weakest of the two (i.e. you fist - or foot) When one object collides (at speed) into an immobile object one or both of the objects must absorb the force of the impact. The least solid or more poorly constructed object deforms to absorb the force of impact. 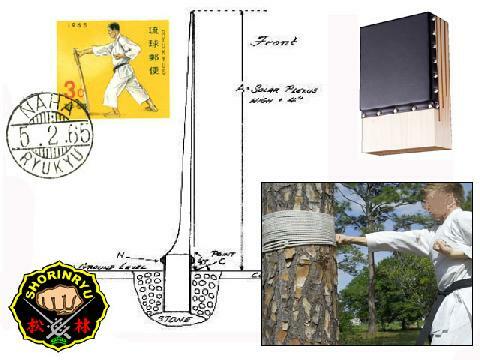 If you strike a tree makiwara (not a sapling) the tree will not deform but your fist/foot will. You ever wonder why they don’t build cars out of iron? They would withstand substantial impacts without even a scratch. However if they did not deform then the object inside the care (you) would. Better a bumper than my face. Its different but still the same basic physics involved in the fist vs. tree. Think about it; I, and most yudansha, can easily break multiple concrete slabs, roofing tile, multiple wooden slabs, etc. It’s not magic, again it’s physics and “mizo no kokoro”. But you know something, I never lay them on the floor and try to break them because I’m not stupid. I place them on a support that allows the energy of my strike to be absorbed into the object (e.g. concrete) causing it to deform and shatter. With multiple layers I simply have to maintain the energy of my strike and the first block will help break the second, etc. While it’s the law of diminishing returns, it still works. For those of us old enough to remember the massive “ice block breaks” from the 70’s, it would appear I’m inaccurate in my statements. Two words: piano wire. Yes I’m sure. Well what about when practitioners get hit with the 2x2 while holding a stance in demos? Repeat after me: Not magic - physics. I don’t have to have assume the “secret iron horse stance of Kusanku”, I just have to be pretty stable and trust my kohai. They must strike me with the 2x2 with the grain and choke up on the beam so that more of the beam extends past me than between the kohai and the target (me). I do not break the beam, I merely stop it, then physics kicks in: an object in motion tends to stay in motion. The momentum of the 2x2 causes it to break itself. Back to the makiwara. A satisfactory makiwara must have play and flexibility in it. (See graphic above) A 4x4 tapered to a 1x4 allows that flexion. I’ve also seen wood squares cut with open spaces to allow flexion when struck. While that’s not idea, it is far better than placing a rag on a concrete wall and punching it. When one achieves yudansha status it is not an end rather the very beginning of learning. The best learning starts with a question and a refusal to believe in magic or secret techniques. Again karate is not about secret techniques . . . well maybe it is, to some of us common sense can seem fairly elusive at times.